I had begun untangle our complex mother-daughter relationship during another trip to London the year before. More than 20 years after her death, I was still caught in a wrenching cycle of love and longing for the larger-than-life, extraordinarily beautiful woman who had been the center of my world. I had worshiped her — had been obsessed with her, really — but slowly I confronted other feelings that floated beneath the surface of our pairing. It had been challenging to be the child of someone who lived boldly outside the lines, to feel that, however unintentionally, she might have broken my little girl’s heart years before. Now, as I stared into the eyes of those maverick historical women, thoughts of all I had learned about my mother — and myself — looped in my mind. From the fragments and photos of our life together, to what had shaped her before she shaped me, my excavation into the past had been full of revelations and exposed secrets. So much so that in the year between the two London trips, my perceptions and misconceptions of who she was and our dynamic had spun me entirely around, and then back around again. I charted an entirely new course and received a gift beyond measure. Write, the women from history now seemed to whisper as I walked among them. Every woman has a story, every mother and every daughter. Stories make sense of our lives. Write. The notion of writing a book struck me at a challenging time. The magazine world that I had thrived in was dying, and I knew I had to somehow trade an old life for a new one. But I was stuck, not clearly seeing which direction to go — until that moment. I began inhaling the life stories of these pioneering women, just knowing that I had to but not really knowing why. Slowly, I began to realize some truths about the women from history. What unified them was the ability to find their way around rules that they hadn’t made but were supposed to live by — which was exactly what my mother had done when the rules governing her life didn’t suit her. My mother’s era had been very different from theirs. But the determination they all had to break out of the domestic sphere — and the choices they made to chase what they wanted and needed instead — helped me to finally reconcile and fully appreciate my own mother’s unconventionality. By surrendering to the serendipity and synchronicity of that one single idea to write, I charted an entirely new course and received a gift beyond measure. The memoir that started as a love letter to my mother surprisingly turned out to be about me… for the first time. In a way, it seemed, I had to understand and tell my mother’s story in order to claim my own. What remains amazing to me is that the moment before the idea hit me — the one that literally transformed my life — it wasn’t there at all. Thankfully, I was open to venturing into unknown territory. I found my voice and my heart in the white space between what was and what could be. 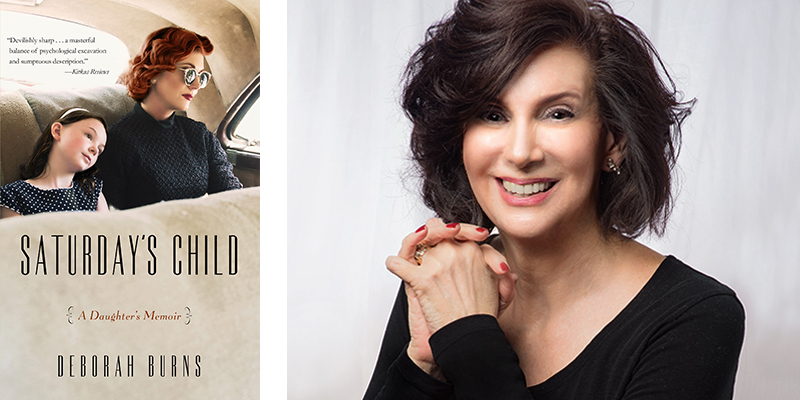 Deborah Burns is the author of Saturday’s Child, a memoir about growing up with her unconventional mother.